First, Irene Priest sent me a cute button to use, and I did want to represent her properly to thank her for her generosity - but I was unable to figure out how to set it up since I'm used to just copying & pasting bloggers' blog button codes from the little widget we all display in the sidebar. She doesn't have a blog set up at this time, and wanted it to to go to her TPT store instead. Better late than never is I hope how she'll see it! Second, I neglected to properly credit Michelle Tsivgadellis (did I really actually finally learn to spell her name?!?!) who is The 3 AM Teacher for the awesome frame I used as my blogiversary image. Those of you who follow me probably already know just how fab she is, and how much I adore and admire her, and likely even recognized her work. But in case not, I've edited the post to add in that credit! Thanks, thanks, thanks, Michelle! And now... ON with the REAL blog post!! 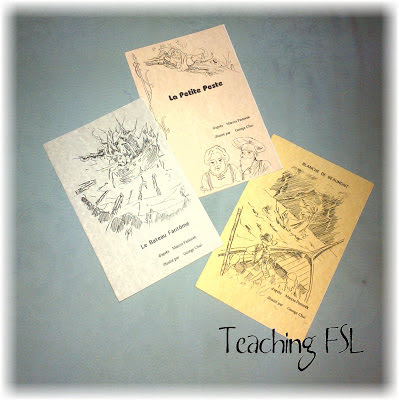 Resources are so hard to come by for teaching drama and dance in French. If you have anything fantastic (and affordable!) 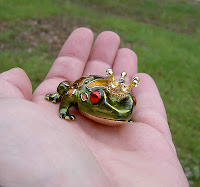 that I need to know about, I'd be delighted if you left a link to the resource in the comments at the end of this post! My students really enjoyed one project in particular this year. I offered four choices of Quebecois legend, each written in a rather simple style (for Core French). I need to thank Marilyn Banack of Le Français Fantastique (and other places!) both for the great stories... one of which I've already misplaced... and for the nugget of this idea. Each group was responsible for reading their legend, and transforming it into a skit. We reviewed the elements of drama and talked about how they needed to show their understanding of these elements in their planning & presentation of the skits. I also looked at how they transformed the work, to include stage directions, direct speech rather than indirect dialogue, and of course the actual writing, as applicable (not very!) for a small French evaluation. I'm hopeless at remembering to take pictures of my students in class... plus there's the whole "Is it ethical enough if I just blur out their faces" kind of thing which makes me feel a little bit ill-at-ease, so I just didn't do it... Plus I forgot my phone at home the day of the presentations! But... I'm happy to share with you the assignment criteria that I set with my students and according to which I evaluated their work. This is based on the current arts curriculum for Ontario. I did originally plan to assess the second and fourth criteria with an informal, observation plus conversation type of evaluation, but discovered that with my sometimes busy group of kiddos, I was better off having them write a brief reflection based on those questions, and assessing their understanding and ability to apply the elements of drama based on evidence provided in this way as well. I did find it necessary to be explicit about now the role of a narrator should be minimized in a play, and provide suggestions for things they could communicate through direct dialogue and character actions rather than description. One last thing for you related to this drama assignment. I provided the following online resources to my students as starting points. and there was a third one which... um.... had European sensibilities shall we say, in terms of depictions of the human body. Email me if you'd like that link for use with mature students. Thank you Mme Aielo! 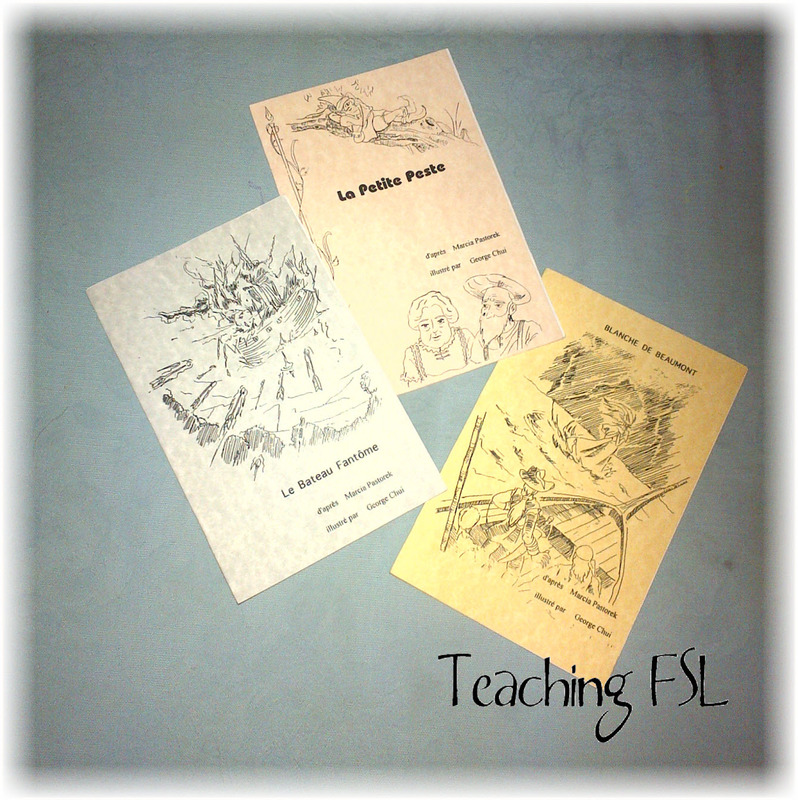 This September I will be starting my first year of teaching core french (gr. 7-12)in BC. I have been trying to think of ways to incorporate drama and (even) dance into the curriculum. I will certainly use your idea! As for the dance, I have a bit of experience in ballroom dance. I plan to teach the very basics in french. To meet BC requirements, I have located a ballroom instructional dvd in French (not the best quality in terms of ballroom) but it'll do. They'll watch and identify key bits of info from the dvd. Finally, we'll have a mini dance, having developed appropriate vocabulary ("May I have this dance?" "I prefer the tango." etc) Over the two weeks or so, I'll also show the movie "Take the Lead" in French, one or two scenes at a time with questions for them to answer. I hope it works but I am trying to use an arts based approach to language learning. Thanks for your post! I really appreciated it. That sounds great, and very ambitious of you to take on in your first year. I haven't heard of Take the Lead, but just checked it out. I like that it has an educator connection. I hope the students enjoy it!